Cast members of improv group "Baby Wants Candy" perform their show "Shamilton!" in Burney Center on Thursday, Jan. 31. UNC Wilmington’s Association for Campus Entertainment presented “Shamilton!” on Thursday as part of Homecoming Week in Burney Center. The event was free for everyone, and ACE hosted another event that had the audience laughing and cheering. Ellen DeGeneres, Steve Harvey, Tom Cruise, and Rosie O’Donnell even made an appearance, albeit as characters within the show. 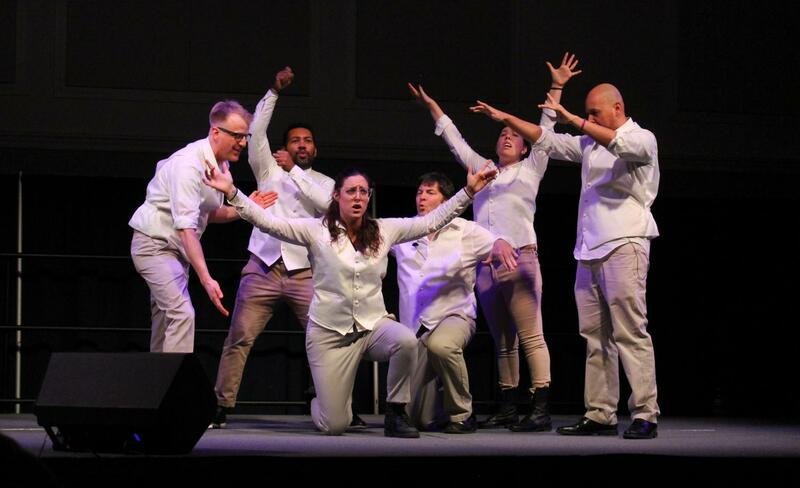 Members of the musical improv group “Baby Wants Candy” visited UNCW on their 2018-2019 tour to put on “Shamilton! The Improvised Hip-Hop Parody Musical.” The show has been sold out in both Los Angeles and in New York, as well as a packed house at the Apollo Theatre in Chicago. “One of the previous activities chairs recommended them to me,” said Holly Pearce, a sophomore and the activities chairperson of ACE. “She said they were really good, and that we should definitely get them. “Some of the members involved with ACE went onto NACA, which is a conference that has different acts that you can bring to campus and she heard about them there,” Pearce said. The on-stage comedians took requests for historical figure or modern celebrities to give them life in a comical way. The group fielded suggestions from John Mulaney to Kendall Jenner, with the crowd eventually agreeing on Ellen DeGeneres. Once the topic was settled, the story developed into Ellen DeGeneres and Steve Harvey battling it out over a time slot for their respective shows. Ellen ended up defeating a volcano with Steve’s mustache. The sound of laughter and synchronized clapping echoed off the walls in Burney Center as members of the improve group freestyled in character. Each performer made up songs on the spot and other members of the group followed suit as if they had rehearsed the whole thing. Homecoming events are not over. On Friday at 8 p.m., Battle of the Bands will also take place in Burney Center.